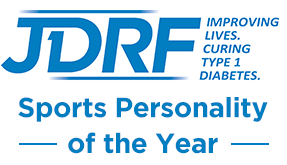 The Diabetes UK Inspire Awards 2016 | Life, Sport and Diabetes - An everyday look at my life with type 1 diabetes. I recently blogged about my surprise and happiness at being awarded a Diabetes UK Cymru Inspire award, and winning thanks to the kindness of the people who put me forward. Well aswell as this award, I was subsequently put forward for a national award, for which I attended the ceremony at the Copthorne Hotel in London. The awards room had been decorated beautifully in the blue colours of Diabetes UK, and was full of inspirational award nominees. Before the awards started, we enjoyed an incredible performance from one of the UK's biggest gospel singer - Annastasia Baker. Not only from X-Factor fame, but a Mum to her little girl with type 1 who was diagnosed a few years ago. The singing performance that Annastasia blessed us with was so beautiful and so moving, but the speech she gave about her experiences of caring for someone with type 1 was awe inspiring. There was also a talk from father and son film makes - Fix Dad. The film is about how the sons helped their dad to change his lifestyle following type 2 diabetes diagnosis, and which will be shown on BBC at the end of the month. It was then onto the awards ceremony itself, where there were so many incredibly deserving award winners, including the wonderful Baldwin family, who have raised over a staggering £50,000 in the last year for Diabetes UK. Although it was loss and sadness that brought this family to the diabetes community, I've had the pleasure of getting to know them, and now call them friends. But everytime we meet, I never fail to be inspired by the strength and determination shown by the whole family, to make sure that diabetes doesn't claim the life of anyone else. So to see them win, I thought my heart would burst with joy. Unfortunately, it wasn't for me to win this time. But I had an incredible day with my Mum at the event and was bolstered by the number of people in the room all working tirelessly to make life better for people like myself, with diabetes.